Chivla some time it is spelled Chivala is a white sand beach in Malvan. If you want to bath safe in sea, then Chivla beach is right place. This is C shaped beach spread over 2 Km from one end to other. Because of its shape and tidal movements, sand deposited in a such way it become shallow compared to Tarkarli beach. Central government constructed a wall of tetra pods to stop erosion of beach sand.This beach has been made a parallel road. Ramps have been built from this road on the beach to take off. To come down on beach, this road is attached with ramps where some local fishermen port their fishing boats. The sheer beauty of the beach is indescribable. Visit the beach to have first hand experience of how pleasurable it can be. This is a beautiful stretch of clean sand and clear waters bordering Malvan town from North West. 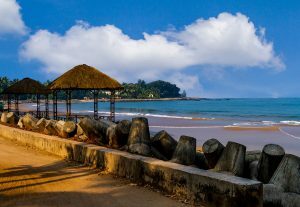 It is a very small beach, calm & serene beach, in evening laze around the beach and watch the sun go down. A small restaurant called Darya Sarang beach resort, Hotel Silver sand, hotel Shirgaonkar, Atithi bamboo serves local fish and refreshment. In December ending or first week of January, Sindhudurg Swimmers Association arrange state level open sea swimming competition. Near about 1300 to 1500 swimmers from all over the Maharashtra state participates. Last 5 years this competition is completed by all swimmers successfully without any accident. Now days the local youngsters at Chivala beach started scuba diving and water sports activities like para sailing, bumper ride, jet ski and speed boat. A Kavada rock is a great attraction of Chivla beach. It is a rocky lonely island spread around 1000 sq meter. Boating towards Kawada island can be arranged from Chivala beach water sports group. A booking counter of these all activities is set on beach near hotel Silver sand. Water sports are available with low price and affordable packages. Chivla beach- a favorite destination of tourists as well as locals. If any one want to book beach side hotels in Malvan then hotels at Chivla beach is right option. 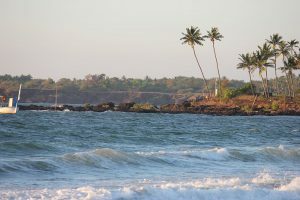 The locals of Malvan also prefer this beach to enjoy rather than tarkarli.